The Corporate Stewardship Council is a unique group of companies with facilities and operations in New Jersey that are united behind a common goal of environmental sustainability and responsibility. Ex-officio Council members are the New Jersey Department of Environmental Protection and the United States Fish and Wildlife Service. Many companies own or manage land in New Jersey located in ecologically sensitive or valuable areas. The Council recognizes the opportunity for these lands to play a critical role in the restoration of valuable habitats and recovery of declining populations of threatened plants and animals. New Jersey Audubon’s Corporate Stewardship Council offers a means for member companies to participate directly in habitat conservation. Each member company works closely with staff at the New Jersey Audubon to evaluate habitat restoration or enhancement potential on their property or affiliated sites. Member companies may also choose to take advantage of additional benefits available to their employees including volunteer work days with New Jersey Audubon staff, onsite environmental programming, and access to New Jersey Audubon staff for guidance on shared environmental concerns. 36 Corporate Stewardship Council projects implemented involving over 26,000 acres. Three Corporate Stewardship Council projects (Verizon, Mannington Mills and Pine Island Cranberry Co.) have won the Governor’s Environmental Excellence Award in the Healthy Ecosystems and Healthy and Sustainable Businesses categories. One Corporate Stewardship Council project, New Jersey American Water, won the New Jersey Business and Industry Environmental Quality Award. Corporate Stewardship Council Member Suez, was recognized by Earthshare as the 2017 recipient of the Environmental Leadership in Business Award. In 2017 Corporate Stewardship Council member Pine Island Cranberry became the recipient New Jersey’s first ever National Bobwhite Conservation Initiative’s National Fire Bird Conservation Award for their work with NJ Audubon on the Northern Bobwhite Restoration Initiative. Based on NJ Audubon’s research into Spelt (Triticum aestivum var. spelta), an ancient wheat capable of serving as grassland bird habitat, Corporate Stewardship Council member Atlantic City Electric is using this agricultural crop as a right-of-way planting for habitat. The spelt grain can provide agricultural producers with economic diversity and stability while also providing critical habitat for grassland dependent birds. Corporate Stewardship Council projects have directly helped improved habitat for 30 out of 84 species listed by New Jersey as threatened or endangered, along with assisting numerous State species of special concern. 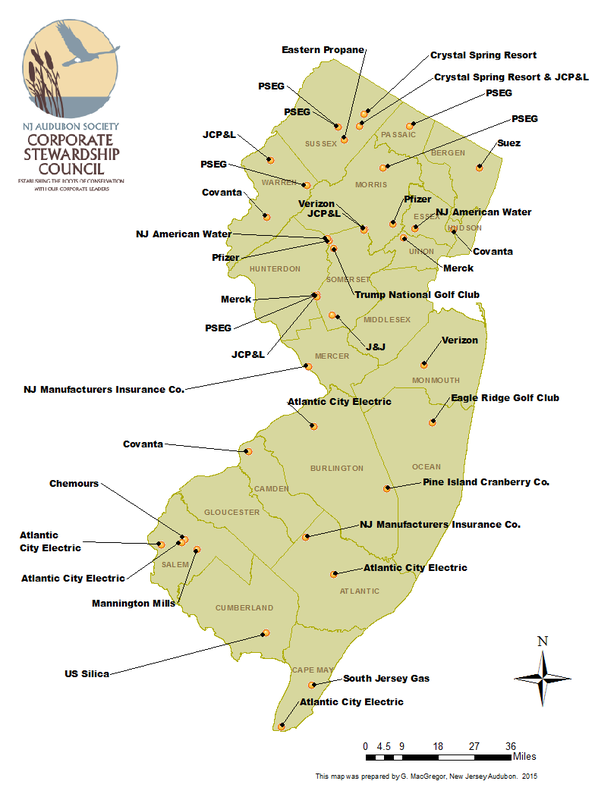 Corporate Stewardship Council members have implemented projects in 18 out of the 21 Counties in NJ. Corporate Stewardship Council members have initiated 36 projects in the State; the U.S. Fish and Wildlife Service has partnered with the Corporations to assist with project implementation on 13 of those projects. Many projects have included nest box installations with monitoring that has resulted in over 1,800 new birds (Purple Martins, Tree Swallows, American Kestrels and Eastern Bluebirds) hatched and fledged. Three Corporate Stewardship Council (Pine Island Cranberry, Suez, South Jersey Gas) members are managing their lands, over 17,000 acres, under NJ State Approved Forest Stewardship Plans.